This hole is a 90-degree dogleg left. Both sides of the first leg of the dogleg are hugged by dense trees, which makes "cutting the corner" a risky proposition. The best tee shot is one that starts straight with a slight draw that turns the corner. This will leave you with roughly 200 yards to the center of the green. A straight tee shot will need to travel at least 200 yards in order to clear the corner, while anything over 240 yards will likely run through the fairway and end up in the rough. 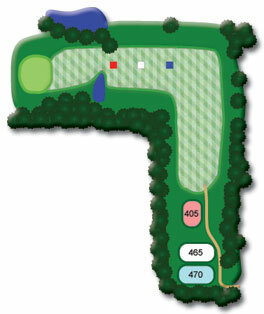 Of course, the further to the right your tee shot lands, the further from the green you will be. The approach shot, which is hit to a green you can't see, can range from 150 yards for those who cut the corner to 250 yards for those who slice their tee shots to the right. A long approach shot also brings the water into play. Typically, the best approach shot is a low shot that lands just over the hill that hides the green, which often helps the ball roll up onto the green. The green slopes from back to front and from right to left. Be sure to ring the bell once you've cleared the 150-yard marker.